Imagine for a moment… that you are taking a magical journey, a stroll through an emerald forest of lush, exotic plants and extraordinary flowers. A flash of the most dazzling red, green and golden feathers crosses your path; a flock of tropical birds — rare, mysterious and beautiful. 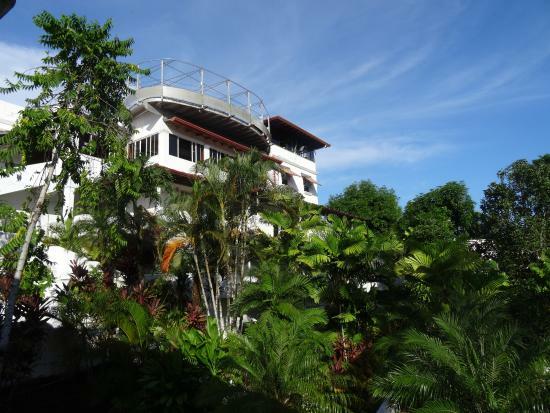 At the Hotel Casitas Eclipse, you’ll experience all the beauty of a true tropical paradise, nestled in the shadow of Manuel Antonio National Park on Costa Rica’s Pacific Coast. Enjoy the hotel’s premier location, absolutely the most scenic in the world, and the comfortable accommodations of its distinctive Mediterranean style villas. Just a short distance away is Manuel Antonio, Costa Rica’s most famous national park, where tropical rain forest meets dazzling white sand. Observe some of the rarest and most fascinating animal life in the world. Costa Rica is home to more than 9000 species of birds and animals. Enjoy kayaking and sport fishing; the big ones are always biting. Or just cuddle up with a good book under a palm tree and enjoy the cool ocean breeze. Experience for yourself the richness of Costa Rica’s Pacific Coast, whether it’s a day at the national park, or an evening of fun and food “Tico style.” Let Hotel Casitas Eclipse turn your trip into the fantasy vacation of a lifetime!